everydaytaichi is thankful for the multitude of experiences from our Tai Chi community. The facility at Kilauea District Park continues to be a perfect fit for all involved. The convenient location, the parking and the spacious rooms work out so well for us. Thank you Sam and the park staff. The trainers at the Kahala Apple Store have made it possible for us to create our own website and provide us with many ideas on how to use technology and the internet to promote our Tai Chi lessons. The extent to which our website has grown truly validates the power of the internet. Many Apple trainers have had a hand in helping us develop our unique website: everydaytaichi.org. Thank you all, we couldn’t do it without you! I am grateful for the many people who support me with my classes in both Tai Chi and Luk Tung Kuen. I am thankful for their help in words and actions which are so meaningful and appropriate for our everyday activities. Last, but not least, I would not be able to undertake this career in my retirement years if it weren’t due to the love and support of my great family. They not only are my solid advisors but they understand me and believe in my mission. I hope to continue to nurture the many nice and fulfilling relationships and situations I have experienced as I carry out my mission to reach out and teach Tai Chi to all. 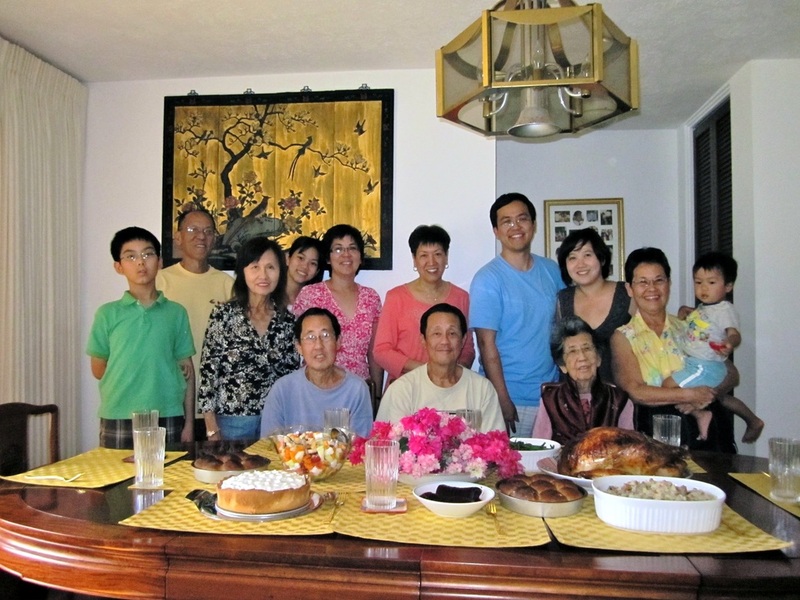 Thanksgiving 2011 was very special. Joel flew in from Washington, D. C. and Les, Susan and Andrew flew in from Maui. Together, we had a wide age span from 18 months to teenagers to adults in their 30’s, 40’s, 50’s, 60’s, and a big jump to 95 years old. We decided to bring back some of the dishes we originally made that our children were accustom to eating when they were still in high school. We had our homemade whole wheat yeast rolls, and added fresh rosemary for a new taste. We brought back another oldie but goodie, pumpkin cheesecake for dessert. Along with our traditionally roasted turkey which this year was soaked in a special brine solution, the stuffing was full of our garden herbs including basil, oregano, both Chinese parsley and flat leaf parsley, sage, chives, rosemary, green onions and dill. Along with other yummy dishes, it was a time to reflect, renew, rekindle and appreciate how fortunate we are to all have good health and the joy of having grandchildren. Although half our family was not able to join us in Hawaii, we still had the opportunity to talk and video chat. For dinner, we were in Pearl City where there was imu style, kalua turkey as well as ham prepared Hawaiian style. Deep fried tako with a a special water chestnut powder was a treat, especially knowing the octopus were caught by Mark and Bryson. It is always nice to relax and stay up to date with both sides of our families! While some relatives cleaned up their buffet tables and kitchens to hurry to get to the midnight sales, others of us with full stomachs headed home to get to bed so we could get to exercise class on time the next morning. Here begins a season of the popular Honolulu Marathon, but also the marathon of eating so many rich foods. It’s the season to balance off our splurge by doing our walking, Luk Tung Kuen, and Tai Chi. You can bet we have many who believe and practice this routine!